Carolina Pulled Pork Sandwiches | Let's Cook With Bry! When it comes to BBQ, North Carolina is known for a unique method of slow cooking pork that produces a tender, mouthwatering meat which is served simply with a large dollop of cole slaw upon a white bread bun. To nearly replicate an authentic taste, it can be prepared in a slow cooker, using liquid smoke to infuse it with that delicious smokehouse flavor. Barbeque sauce need not apply! And yes, your house WILL smell like vinegar while it’s cooking, but that’s a small price to pay for this wonderful meal. 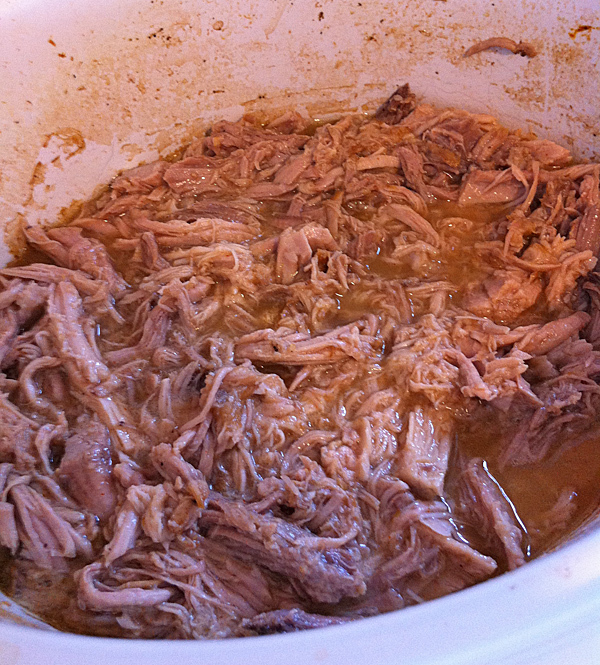 Place the pork shoulder into a slow cooker and season with onion powder, salt and pepper. Pour the vinegar and liquid smoke around the pork. Cover, and cook on Low for 12 hours (the results will be much better if you cook it overnight), or on High for 4-5 hours. Pork should easily pull apart/disintegrate into strands. 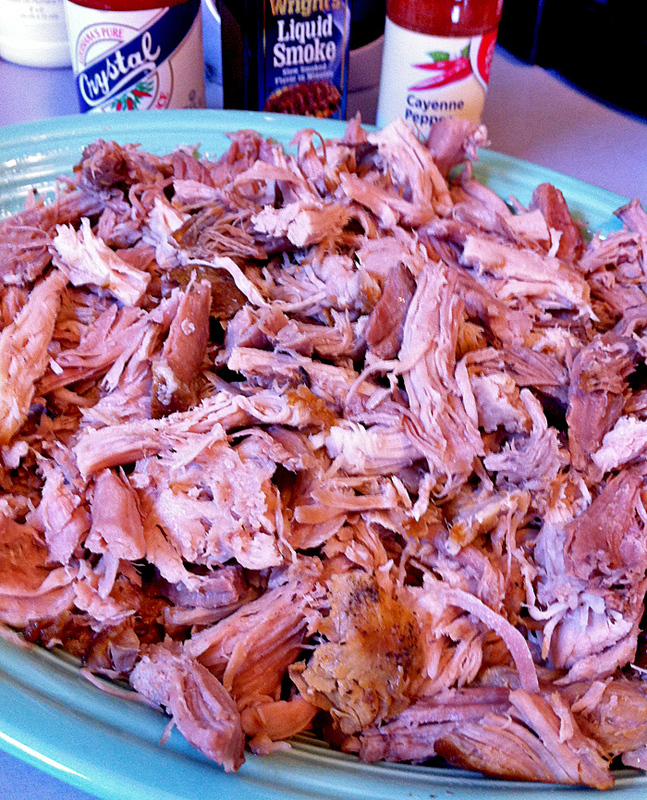 Remove the pork from the slow cooker and discard any bones. Strain the liquid, reserving 2 cups and discarding any extra. Using tongs or forks, shred the pork into uniform bite-sized strands or chunks while removing any bits of fat – if cooked properly, this should be effortless. Skim the reserved liquid and pour back into the slow cooker, and whisk in the brown sugar, hot pepper sauce, and cayenne pepper. Add the shredded pork to the liquid and mix thoroughly. Cover and keep on Low setting until ready to serve. 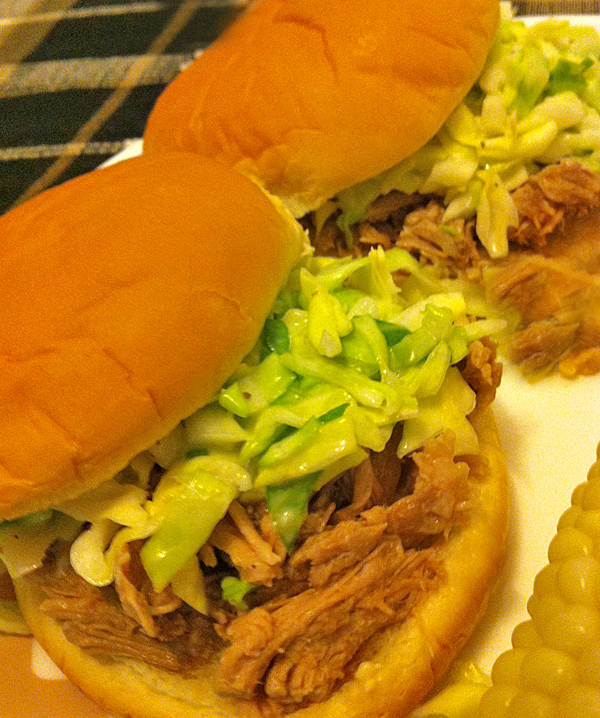 Spoon a manageable portion onto a bun, and spoon a coupla tablespoons of cole slaw on top of the pork.